Satin trimmed year-round hat. Rhinestone and feather accents. Year-round hat. Covered with pleated metallic tissue-lame. Metallic stud and rhinestone band around crown. Topped with metallic stud and rhinestone band trimmed rich metallic panel curls. Rhinestone brooch accents. rown size: 22 1/2" / Brim width F: 4". 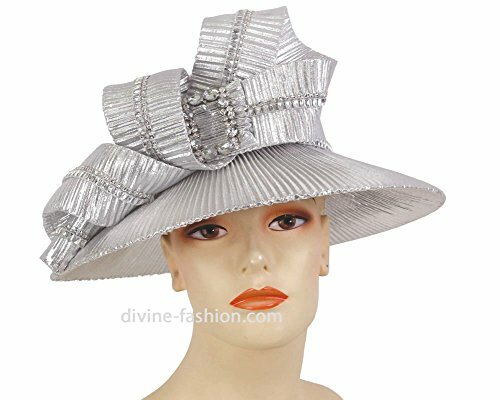 B 3 1/2" / Crown Height 3 1/2" / Brim to brim 14 1/2"
If you have any questions about this product by Ms. Divine Collection, contact us by completing and submitting the form below. If you are looking for a specif part number, please include it with your message.